See what I did there? With the title? Am I clever, or what? Aerosmith frontman (forever! 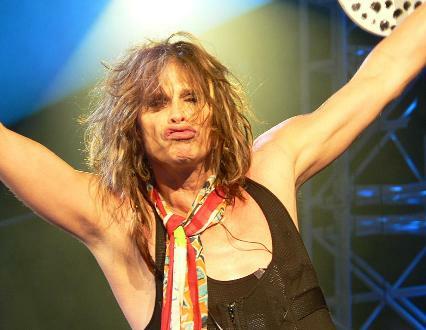 ), Steven Tyler, was born Steven Victor Tallarico in Yonkers, New York on March 26, 1948. Aside from their kickass music and Steven’ incredible stage presence, the singer / songwriter is often more known for his heavy drug and alcohol use in the 1970s and 1980s. He completed rehab in 1986 and remained sober until 2009 when he began to abuse pain killers, which were prescribed to him after he fell off the stage during a performance and fractured his collar bone. Steven Tyler has since entered and left rehab, claiming to once again be in fighting condition. Steven Tyler is ranked 3rd on Hit Parader’s Top 100 Metal Vocalists of All Time, and was named 99th on Rolling Stone’s 100 greatest singers. On 15 February 2010, it was announced that Aerosmith would headline the Download Festival in Donington, England with the affirmation that Steven Tyler alone would appear as singer for the group. On 26 March 2010, it was reported that Steven Tyler, intrigued by the 2009 Chris Cornell record Scream, would be teaming up with Timbaland to record a rap album. Guest appearances by Reverend Run and Daryl Mac of Run DMC, Kid Rock, and T-Pain are rumored to be featured on the new project. Happy Birthday Steven Tyler! I hope there are many more to come. previous post: Miley Cyrus Turning Into Beautiful Woman. But She Still Bugs.